For those of you keeping score at home, my living room refresh is now complete! I am really excited about the way the space came together and I have a few ideas you can use when refreshing your space. As Chip Gaines from Fixer Upper would say, "Without further ado...."
Now that our affair is over, I've moved on. A new chapter, a fresh start, with so many design decisions to make! It's almost like planning a wedding. Here's how adding something old, something new, and something borrowed can refresh your space without your wallet feeling blue. Paint has your back; it's your go-to guy. On walls it will clean up the space and help coordinate the rest of the wedding party. But it's not just for walls any more. Sworn to secrecy like your best man, it can cover a multitude of sins. Bookcases that resemble Zach Galifianakis in the movie the hangover? Paint them. Picture frames not getting along with the rest of the artwork? Paint them. For the walls in my space, my go-to guy was a moody gray. I chose a saturated green for the bookcases. Even though the best man is traditionally supposed to help avoid drama, in my case the drama created by the unexpected combination of the brilliant green against the dark gray walls is a good thing. The gray fulfills its groomsman duties by softening the green the same way the best man calms the groom when they're standing at the altar. Fabric is the preacher at the wedding. With color and pattern, fabric can marry all the elements of a room. My sofa was already upholstered with a textured light gray fabric with hints of black and dark gray. 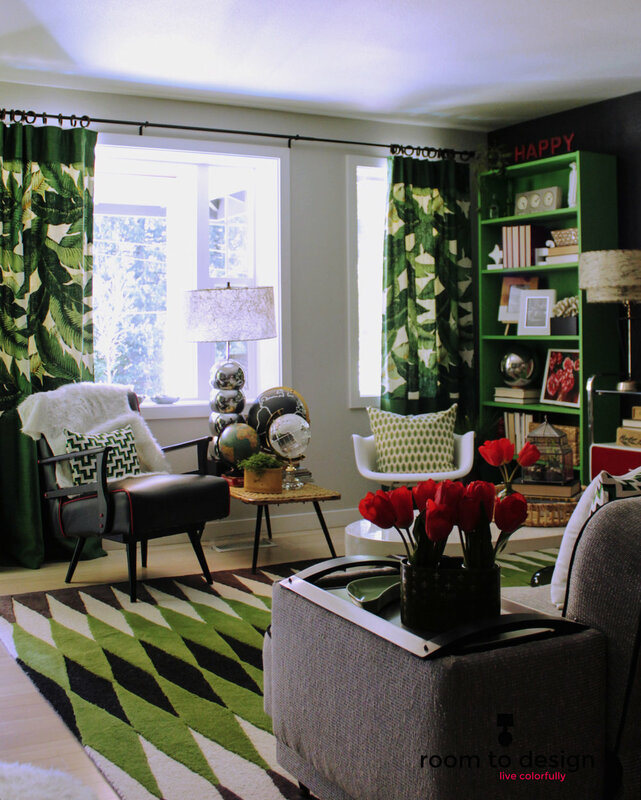 I brought in fabrics with varying shades of green, a few touches of black and lots of white. Just as a good preacher can bring a congregation together, using the same fabrics in different ways brings balance and unity to the space. I used the large scale banana-leaf fabric (draperies and pillows) to balance the smaller scale geometric fabric (additional pillows and dividing screen). Think of your floor plan as a seating chart at the reception. There is a lot of rearranging and adjusting so that Stacy won't have to dine with Cliff (messy divorce) or so ultra conservative Aunt Mildred isn't seated next to your pierced and tattooed college roommate. You get to decide what goes where and who would make the best partners at the table. Rearranging the floor plan is the no cost way to freshen a space. In my living room, I decided to leave the piano off the guest list, I felt it was too big and would dominate the conversation like Uncle Bob when he's had a few. That gave room for the rest of my "guests" to move around. Switching the bookcases with the large art work allows the space to feel more open. I bought quite a few of the oldies back. In addition to the revamped bookcases, I kept the anchor pieces, the sofa, coffee table, console, accent chair and large artwork just adjusting them according to the new seating chart. A big trend in interior design, and weddings, really, is to bring in natural elements (out door venues, anyone?). Wood, rattan and natural fibers can add warmth to shinier finishes, like my coffee table and the chrome and glass console. I bought some new baskets, a wicker tray and a fabulous lantern as accessories. Creating a new gallery wall with a nature theme including a map, large philodendron leaf, bug artwork and burlap details adds some personality to the space (read about the gallery wall here), I also made an old sofa table new again by adding a live edge slab of wood to the top. A white Eames style rocking chair borrowed from another room and a upcyled furry ottoman (an idea borrowed from versions found in stores) brighten the color scheme and add fun texture to the space. Everything's in place. The wedding march plays softly in the background, but wait, something's missing. Where's the bride? Where's the one member of the wedding party that brings everyone together? In this make over, that member was the rug. But just like the moment Julia Roberts decides to cut and run from her wedding, I found out the rug I ordered was no longer available. I wouldn't suggest substituting another stand in for a real bride, but in this case it was written in the stars that my first pick had cold feet. After some searching, I found a new rug, perfect for the space. It was love at first sight! Let's hear your thoughts on this marriage of old, new and borrowed. You can leave your comments below. If you need help marrying your design style to your home, drop me a line. I can help you plan your wedding...I mean...your space!